The Rac-Con is a third-party controller for the Sega Saturn. 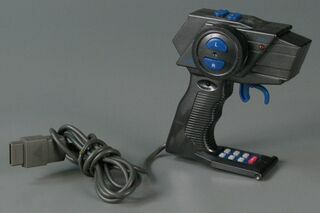 The Rac-Con acts as a smaller (and therefore cheaper) alternative to the Arcade Racer Joystick. Rather than use a traditional steering wheel, a much smaller analogue wheel is mounted on the side of what is almost shaped like a gun controller. A variant for the PlayStation also exists.